Rodanthe Pier after the Nor'easter. As you stroll out toward the end of the Rodanthe Fishing Pier, it is impossible not to notice that it’s not entirely straight. It goes a little bit up. It goes a little bit down. The pier jogs a little to the right and left in different places. A few boards are loose, too, and it’s mighty windy. In other words, it’s not perfect, but for Terry Plumblee, being here is a lifelong dream come true. Plumblee is a retired Naval engineer. He and three partners bought the Rodanthe Fishing Pier out of foreclosure four years ago. It was in pretty rough shape, so they rebuilt it, freshened up the paint color, expanded into souvenirs and T-shirts, got rid of the pool tables that drew the wrong crowd and re-opened for business. It went great for a while, until February of this year, when a Nor’easter tore down the coast and tore off 80 feet from the end of the pier. The owners had enough saved to rebuild the pier and a GoFundMe campaign also helped, but they can’t put the beach back. 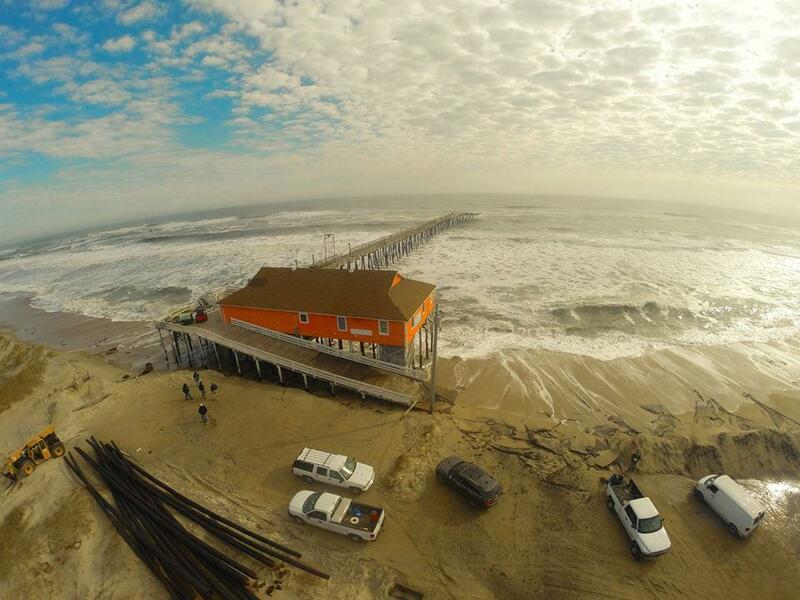 That puts the Rodanthe Pier at a severe risk for more storm damage. For those who do not live on the coast, names like Hazel, Fran, Irene and Sandy might sound like the champion shuffleboard team at the local senior center. 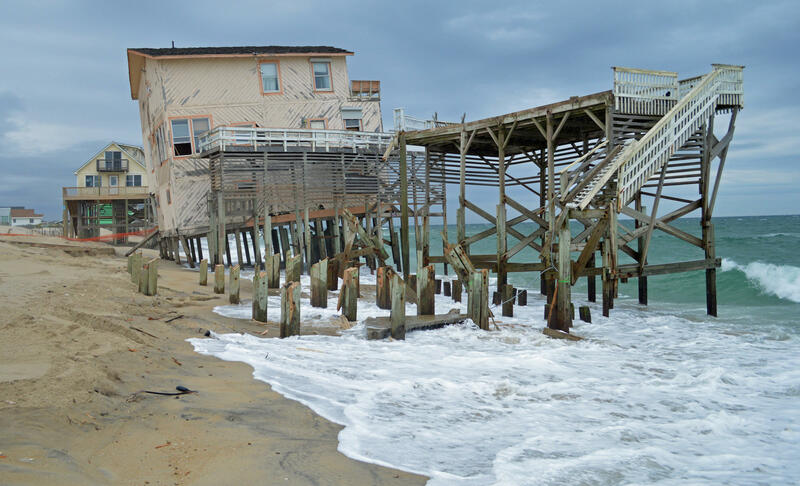 But for those who live on the Outer Banks, they are the names of storms over the years that, often enough, destroyed their homes and businesses. And according to scientists, it is only going to get worse. The theory is that the increase in devastating storms is due to the growing difference in temperature between the oceans and the atmosphere. Along the coast, a few miles in how a storm tracks can mean the difference between a forgettable event and a catastrophe. If a hurricane comes from the ocean side, wind can damage homes and cut new inlets. But it’s the sound side storms that are the real problem in many places, and one that could get much worse – especially given the recent Science Panel report that predicted sea levels will rise between two-and-11 inches or so in North Carolina over the next 30 years. “If you couple the high-category events with increased sea level you are really starting to come up with very strong risks of storm surges, which are like tsunamis, and in practice do a lot of the damage in hurricanes,” says Emanuel. Storm-damaged houses in Nags Head. North Carolina has had a lot of practice dealing with the damage from hurricanes. State and federal governments have spent many billions of dollars rebuilding homes, businesses, roads and beaches. And the state has strict rules for how close houses can be built along beaches and sounds, and how high they need to be. But those rules may not be enough. Young says it is bad fiscal policy to constantly rebuild after storms, especially if those storms are increasing and more people are building investment properties and hotels on the beach. That kind of talk, no matter how reasoned it may sound to some people inland, is summarily dismissed by those who trace their roots back a century or more on the Outer Banks. “You got a community that has heritage here,” says Willo Kelly, the government affairs director for the Outer Banks Realtors Association. 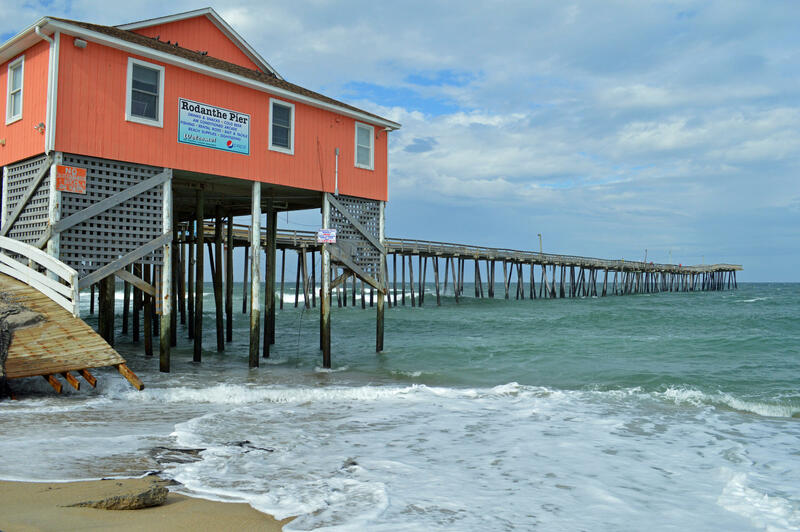 The ocean has eroded more than 100-feet of beach underneath the Rodanthe Fishing Pier. 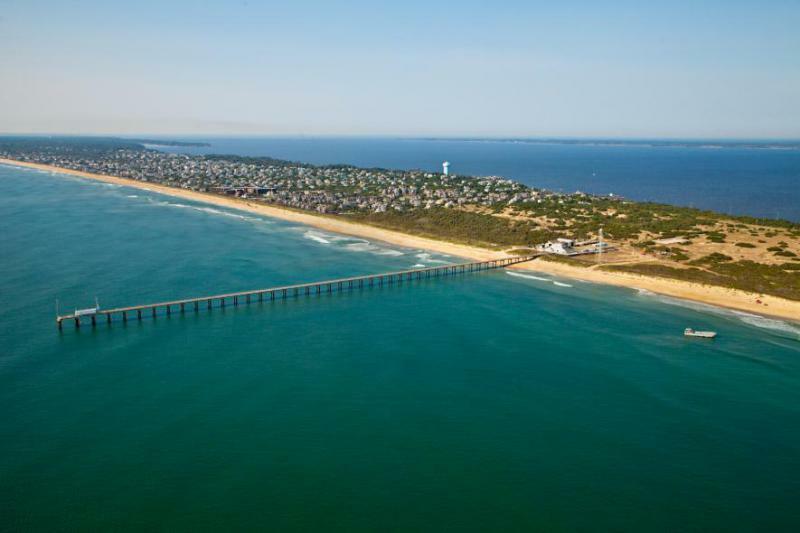 But not everyone has been on the Outer Banks for generations or owns a multi-million dollar investment property. For some, like Terry Plumblee at the Rodanthe Pier, it’s about a simple business, and a simple life. As Plumblee talks, the surf smashes into the pilings holding up the pier house. The vibrations come up through the floor of the building and rattle the plastic chairs we’re sitting in. That 100 yards of beach he thought he bought four years ago is gone and the waves are already threatening his brand-new parking lot behind the building. And this is a relatively calm day. When asked about the scientific predictions that 100-year storms could happen every decade—and could eventually send his pier into the ocean—Plumblee shrugs. “I don’t pay a lot of attention to it, to be honest with you,” he says. 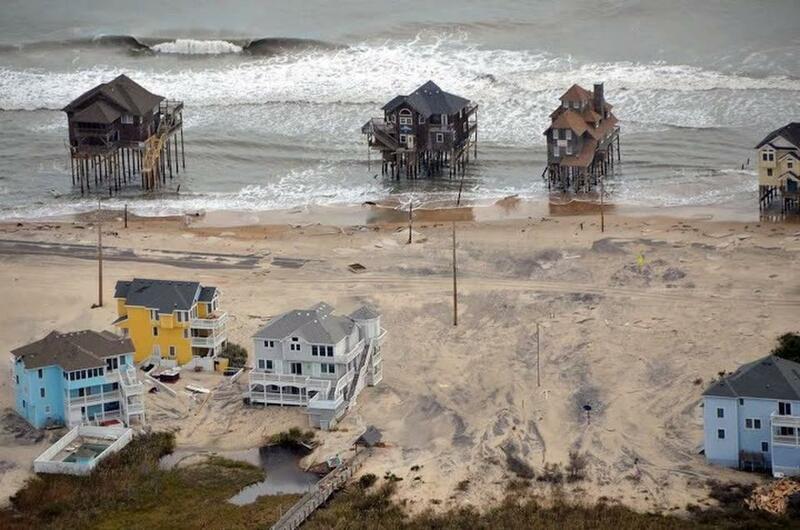 Beach houses after Hurricane Sandy. 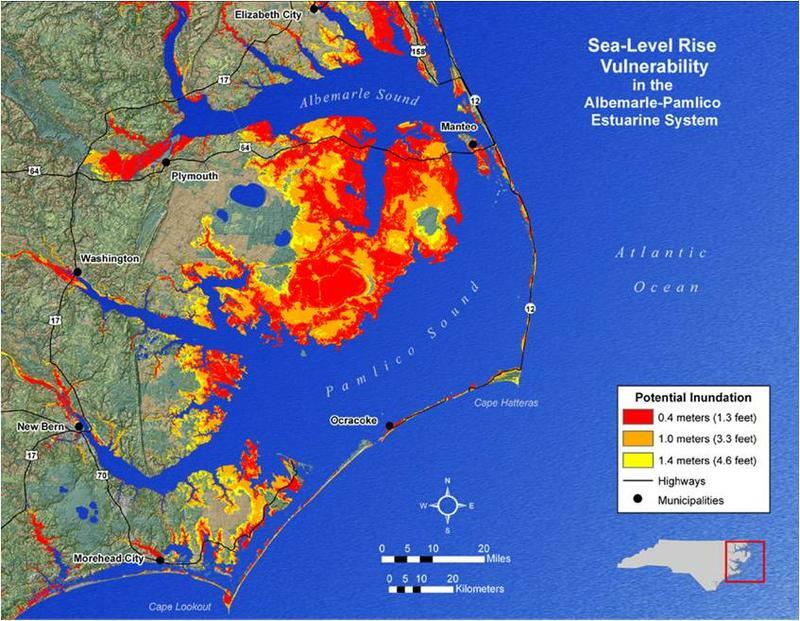 North Carolina’s most recent Sea-Level Rise Report is the product of decades of tidal gauge data, computer modeling and hundreds of years of collected scientific expertise. But Jon Britt doesn’t need all that to tell him the water’s getting higher. He just needs to look out his back door. Jockey’s Ridge State Park in Nags Head is North Carolina’s most famous giant pile of sand—and the tallest natural sand dune in the eastern United States. 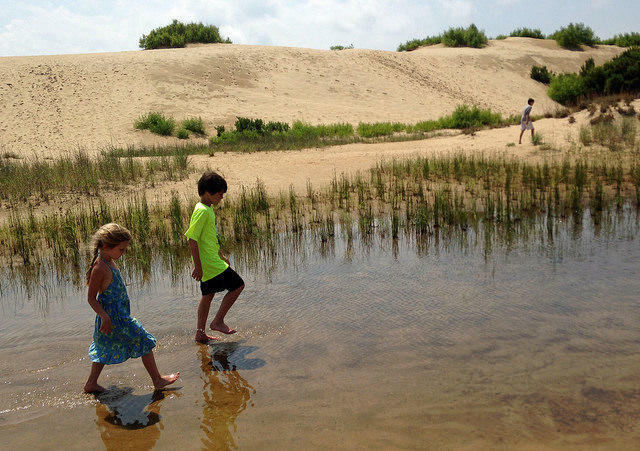 But here’s a little secret: Even a remarkable all-natural phenomenon like Jockey’s Ridge needs a little man-made help. A few weeks ago, the ocean washed away a 200-foot stretch of Highway 12 in Kitty Hawk. It wasn’t destroyed by a hurricane or a Nor'easter. It was just another storm. Geologists say it is one more example of how life is changing along the North Carolina coast, thanks in part to the rising sea level.